Some ideas for travellers to U.S.A.
California: Dream big in the Golden State. California provides the backdrop for dreamers like chefs, shopkeepers and wellness experts to follow their passion to find success. The new VisitCalifornia.com launched January 2015, inspiring Canadians to dream big when planning their vacation in the Golden State. For those that enjoy the finer things in life, superlative indulgences await in California for the ultimate bespoke vacation – from private vineyard experiences in Napa and cycle tours around Santa Barbara to chef dinners in San Francisco and glamping in A-framed huts in the San Jacinto Woods. Greater Palm Springs, Calif.: Nestled in Southern California’s Coachella Valley, Greater Palm Springs is located two hours east of Los Angeles and comprised of nine unique cities – Palm Springs, Desert Hot Springs, Cathedral City, Rancho Mirage, Palm Desert, Indian Wells, La Quinta, Indio and Coachella. La Quinta. This CA$520 million US project will include a 140-room, luxury hotel and spa with lobby and pool bars, fitness center and a restaurant, a 200-room “lifestyle” hotel with a spa, fitness center, lobby and pool bar. Go behind the scenes at the Coachella Valley’s windmill farms with new tours now available. A Brand New Day. www.visitgreaterpalmpsrings.com. 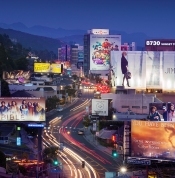 From the world-famous Sunset Strip to iconic architecture like the Pacific Design Center and Sunset Tower Hotel, West Hollywood truly is unique. Take a peek into the historic buildings and innovative ideas that make this city so one-of-a-kind. It’s that time of year again. Each year, on October 31st, nearly 500,000 people take to the streets of Santa Monica Boulevard for the West Hollywood Halloween Costume Carnaval – the largest Halloween street party in the world. Attendees can expect to see the craziest, most eccentric costume creations ever, along with fantastic live entertainment and food vendors. 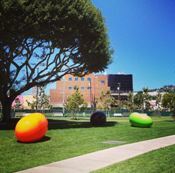 Admission is free and the event runs from 6 p.m. to 11 p.m.
Three massive, nine-foot long and five-foot tall, shiny jelly bean creations can now be seen in West Hollywood Park. The “Love Your Bean” installation is the work of Canadian sculptor Cosimo Cavallaro and will be on display in the park on San Vicente Blvd. directly across from the Pacific Design Center until June 2014. SANTA MONICA, Calif. – Dec.19, 2012 – Popeye, Olive Oyl and Swee’ pea will return to the sailorman’s Santa Monica hometown to kick off the city’s inaugural Eat Well Week . To celebrate California Restaurant Month, more than a dozen of Santa Monica’s top restaurants will offer discounted pre-fixe menus and new healthy menu options from Jan. 6 through Jan. 13, 2013. To launch the occasion, Popeye will join three participating Eat Well Week restaurants-Locando del Lago, The Lobster and Ocean & Vine at Loews Santa Monica Beach Hotel-to create “Popeye Pop-ups”, featuring healthy spinach inspired dishes and recipes on Wednesday, Jan. 2, 2013 from 11 a.m. to 1 p.m. at the Downtown Santa Monica Farmers Market. The King Features character is a Santa Monica creation both figuratively and literally in that Popeye was created by E.C. Segar in a Santa Monica studio on Jan. 17, 1929 and according to the story line, was born off the coast of Santa Monica during a typhoon. Popeye’s popularity and his taste for spinach quickly turned him into an immediate health food advocate. According to the U.S. Census Bureau, soon after Popeye appeared in the syndicated comic strip “Thimble Theatre”, spinach became the third favorite children’s food-after turkey and ice cream. For more information about Popeye the Sailor Man, please visit www.Popeye.com. Popeye was not the only “heavy lifter” with big forearms to hit Santa Monica shores. Home to the Original Muscle Beach, Santa Monica has been attracting fitness gurus for decades. Today, Santa Monica is still widely known for its active lifestyle and is at the forefront of many health trends. Whether you are inspired by food, fitness or fashion, here are a few healthy tips from the Santa Monica wellness community. Start with Healthy Ingredients: Tap into your culinary skills and leave microwave dinners behind for good! A clean healthy diet begins with fresh simple ingredients. Start 2013 off right by visiting the acclaimed Santa Monica Farmers Market. Choose from four weekly markets, each with their own unique personality and experience, to discover the seasonal ingredients that will inspire your new lifestyle. Visit smgov.net/farmersmarket for location details and recipes. Make a resolution…to Buy Local: With each purchase made close to home or work you make an investment in the local economy, save time, and reduce your carbon footprint. Support Santa Monica businesses by buying locally! Learn more at buylocalsantamonica.com. Discover Santa Monica from a Bike’s-Eye-View: Explore the city while burning a few calories with a self-guided biketinerary! Rent a bike from the Santa Monica Bike Center and select one of seven “Best Rides” according to difficulty and distance. Start at the Core: Developing a strong core is one of the best ways to improve posture, develop abs of steel and prevent chronic back pain. Take care of your body with Core Fusion classes at exhale Santa Monica . Choose from a variety of boot camp and yoga classes and get started on your path to transformation. Then! Revive and restore your sore muscles with our new Sports Massage! Fitness Fashion: Need some extra fitness motivation? Let a new workout wardrobe inspire you! Lorna Jane at Santa Monica Place lets you make a sporty statement in bright hues and vibrant prints made from intelligent performance fabrics that are perfect to go from the juice bar to the gym in ultimate style. Receive 10% off your purchase during Eat Well Week with proof of receipt from a participating restaurant. Get Outside: Turning fitness into fun is a key component for long-term weight loss. Whether you prefer surfing, volleyball or beach yoga; O’Neill’s flagship store in Santa Monica has everything you need for a fun and active day at the beach from towels, wax, surfboards, board shorts, bikinis and wetsuits to O’Neill 365, a new fitness line rooted in the same technology and innovation that first invented the wetsuit in 1952. Healthy Hair Care: Now that you have a new and improved look, why not add healthy hair to the list! The Broot, a new salon Montana Avenue, offers five deep-conditioning hair masks made with simple raw ingredients like avocado, honey and oils. Your tresses deserve an all-natural, healthy diet just like your body does! Treat Yourself: After all that hard work, we recommend you relax and unwind. Holidays stress you out? Visit Alchemie , Santa Monica’s new organic spa retreat offering nature inspired spa services including massage, facials, manicure, pedicure, body wraps + scrubs, hand + foot rituals, waxing and spa packages. Start the weekend right with Friday Happy Hours featuring mini treatments, wine, appetizers and retail sale specials. Santa Monica provides a healthy dining experience year round where fresh Farmers Market produce plays a central role. Dine local and learn more about Eat Well Week and Santa Monica’s wellness scene, by visiting www.santamonica.com/eatwell. King Features Syndicate is a member of Hearst Entertainment and Syndication Group, which combines Hearst Corporation’s cable network partnerships, TV programming activities, newspaper syndication and merchandise licensing operations. King Features is the world’s premier distributor of comics, columns, editorial cartoons, puzzles and games, distributing in print and online some 150 features to nearly 5,000 newspapers and other outlets around the globe. It is one of the largest and most experienced organizations in merchandise licensing and entertainment. It represents some of the most recognizable global brands, including Betty Boop, Popeye the Sailor Man and Olive Oyl. For more information, please visit www.kingfeatures.com. Follow us on Twitter @King_Features. Like us on Facebook at www.facebook.com/king-features. Santa Monica Convention & Visitors Bureau (SMCVB) is a non-profit organization designed to increase visitor expenditures, tourism revenues and local employment opportunities through the promotion of Santa Monica as a travel destination. For travel and accommodation information or a free copy of the Official Visitors Guide, the public can write to the Santa Monica Visitor Center, 1920 Main Street Suite B, Santa Monica, CA 90405; call (800) 544-5319 or (310) 393-7593; visit www.santamonica.com; or email info@santamonica.com. Follow SMCVB on Twitter @GoSantaMonica or become a FaceBook fan at www.facebook.com/visitsantamonica. CARMEL-BY-THE-SEA, CALIF. – 2013 – It’s tricks for an upgrade this February/2013 at Hollywood ingénue and animal advocate Doris Day’s legendary Cypress Inn. Carmel’s iconic 1929 landmark will roll out the red carpet with a month-long salute to pampered pooches including value-priced accommodations and a host of perks even Sadie — the Inn’s Director of Pet Relations — would lap up. Available February 1 – 28, 2013, the Puppy Love package starts at $199.00/night, double. www.cypress-inn.com. Ahead of the curve, Cypress Inn was one of California’s first hotel properties to welcome pets in the mid-1980s and has since seen everything from parrots to pot bellied pigs check in for an adventure by the sea. Standard operating procedure includes concierges carrying grain-free all-natural dog treats and all of the Inn’s 44 crisp, contemporary guestrooms appointed with dog bowls, plush dog beds and in-room fireplaces. Top treats for February include Tricks for an upgrade upon arrival (based on availability) and complimentary Cypress Inn logoed collar tag for Fido to tout his travels. Love is in the air with a visit to Ajne Organic Perfumes for a choice of hand blended Furfumes crafted from natural, plant extracts. For pups in need of a time-out, Tro daBone focuses on calming overactive pets and includes a natural flea and tick repellant. Kennel No. 5, a favorite among smaller breeds, is crafted for nurturing, while Breed perks things up with a frisky aphrodisiac scent. Puppy Love guests receive a ½ oz. Furfume of choice; a 60-minute custom blending session is also available for $99.00. Things start to shake up in the afternoon, as Terry’s Lounge rolls out Yappy Hour daily from 4:00 p.m. to 6:00 p.m. A vintage slice of Hollywood by the sea, Cypress Inn salutes all things retro with a classic cocktail menu and complimentary Muttini for four-legged drinkers. A new Culinary Canine Menu debuts February 1st including such delicacies as Steak Tartar, Chow Hound Chicken and Fish & Chips. One complimentary entrée rounds out the Puppy Love package. – Starting at $199.00/double. Two night minimum, based on availability. – Does not include taxes; blackout periods apply. An iconic landmark since 1929 and part of the elite collection of Carmel Boutique Inns, Cypress Inn embodies Hollywood-by-the-Sea elegance with casual seaside charm. Co-owned by legendary Hollywood actress and animal rights enthusiast Doris Day, the 44-guestroom property is set in a Mediterranean footprint with vaulted ceilings, airy courtyards, in-room fireplaces and a crisp, contemporary décor. Ideally located just blocks from Carmel Beach and walking distance to 100+ art galleries, Cypress Inn offers afternoon tea, a pet-friendly Yappy Hour and sustainable dining menu at Terry’s Restaurant & Lounge, Carmel’s first and only Seafood Watch program participant. Carmel-by-the-Sea is one square mile of incorporated city set along Carmel Bay on the Monterey Peninsula. It is located 120 mi./192 km., south of San Francisco and 350 mi./560 km., north of Los Angeles. The Monterey Peninsula Airport (MRY) is served by non-stop flights from Denver (DIA), Las Vegas (LAS), Los Angeles (LAX), Phoenix (PHX), San Diego (SAN) and San Francisco (SFO). SANTA MONICA, Calif. – Santa Monica is home to beachfront hotels, world-class restaurants and this January, Cirque Du Soleil’s OVO ! The beachfront tent from Cirque du Soleil returns to the Santa Monica Pier starting January 20th. 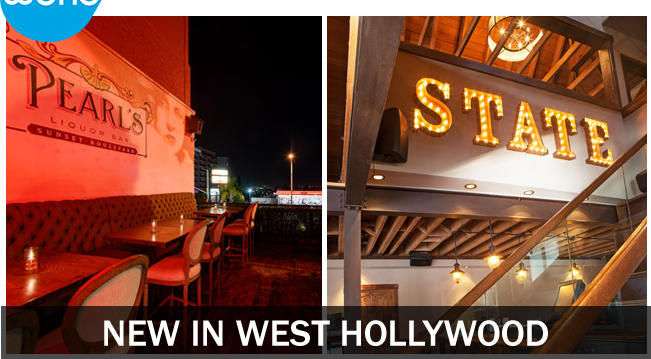 Ideal for a date night or an in-town getaway, Santa Monica Convention & Visitors Bureau (SMCVB) is rolling out the red carpet for OVO ticketholders with creative hotel packages and dining and retail specials throughout the months of January and February. Over 45 Santa Monica restaurants from Downtown Santa Monica to Montana and Ocean Park neighborhoods will participate in dineLA Restaurant Week 2012 from January 22-27 and January 29-February 3, 2012. The specials are available with a pre-fixe menu: Deluxe Dining is $16 for lunch and $26 for dinner; Premier Dining is $22 for lunch and $34 for dinner; and Fine Dining is $28 for lunch and $44 for dinner (beverages, tax and gratuity are not included; participating meal periods vary by restaurant). Take a photo of your experience enjoying dinner at one of the Santa Monica’s participating dineLA restaurants or attending Cirque du Soleil’s OVO at the Santa Monica Pier. Post a Twitter update including @GoSantaMonica and the hashtag #SantaMonicaDate. The winning couple will be notified by February 6, 2012. For more information on the contest, visit www.santamonica.com/date. OVO ticketholders can enjoy special deals, weekend getaways and other creative offers during their visit to Santa Monica for Cirque du Soleil. Amenities include signature cocktails, tasting menus, complimentary valet parking, and even trapeze lessons. Cirque inspired hotel packages and discounts can be viewed at www.santamonica.com/cirque-du-soleil/. California, Events, Music, Places to Travel, San Francisco, Santa Monica, U.S.A.
for a never-ending summer and a personalized luxury hotel experience, fostering savoir-vivre. winter-get-up and enjoy a range of activities from bicycle rides down the coast to ice-skating at the beach. handpicked produce from the local Santa Monica Farmer’s Market. experience that fits your needs, and spend your holiday in the sun. California, Events, Music, Places to Travel, San Francisco, U.S.A.
As a true Gay Mecca, San Francisco can sometimes overwhelm visitors with its vast number of activities which appeal to the LGBT Community. Often referred as the “First Lady of San Francisco,” Donna Sachet’s more than 20 years of experience and affiliations with a broad spectrum of the LGBT Community will guide you through the year’s highlights. From entertainment to fundraisers, from small events to major galas, and from the Castro to the entire City, Donna is tapped into everything that is happening in San Francisco and she will share the “what, when, and where” with you in her quarterly updates. Santa Monica, Calif. (August 3, 2011) – There are many things to love about summer! Sundresses, shorts, flip-flops and large floppy hats, sunshine, blue skies, sand castles, picnics and warm nights just to name a few favorites. But along with lazy afternoons and fun outdoor activities comes the hot, humid days that can put a damper on anyone’s plans, confining even the most sun-loving travelers to an air-conditioned room. Unless you’re in Santa Monica, where the average summertime temperatures hover in the mid 70’s. 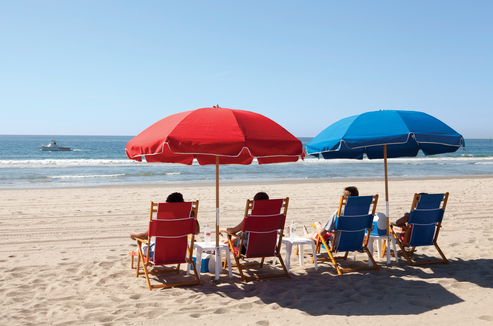 The quintessential Southern California beach city has a few suggestions on how to beat the heat this summer – for more summer fun and deals, visit www.santamonica.com/summer-specials. 1. Ice Cream – A summertime staple, ice cream received a makeover in Santa Monica with the opening of Beachy Cream, an ice cream shop known for using locally sourced, sustainable and organic ingredients. Try a Strawberry and Boysenberry Beachy Ice Pop made with farmers market organic fruit or the Key Lime Cowabunga ice cream sandwich. 2. Ocean Breeze – Book a room and enjoy a natural form of air-conditioning while poolside at Fairmont Miramar Hotel & Bungalows, Loews Santa Monica Beach, JW Marriot Santa Monica Le Merigot, Viceroy Santa Monica, Sheraton Delfina or Shangri-La Hotel. A cool summer breeze, a fruity cocktail and the Pacific Ocean. Enough said. 3. Pedal or Not in the Wind – Make your own cool breeze by taking an electric bicycle guided tour of Santa Monica and zoom along the coast, sometimes reaching speeds of 20 miles an hour. 4. Grab a Cold One – Stop by local favorites like Library Alehouse, The Yard and Ye Olde Kings Head and sample their impressive draft beer selections while sitting on a shaded patio. Nothing beats a cold beer on a hot day! 5. Pacific Park – Ride the roller coaster at Pacific Park, the West Coast’s only amusement park located on a pier. The park is also home to the world’s only solar powered Ferris wheel that offers panoramic views of the Pacific Ocean from more than 130 feet above the pier. 6. Soda Jerks – A throwback to the 1920’s and 30’s, recently opened Soda Jerks on the Santa Monica Pier prides itself on making everything by hand. It offers a full service soda fountain, sundaes, shakes, malts, ice cream sodas and locally famous Fosselman’s ice cream. 7. Surfing – Grab a surfboard and let the Pacific Ocean cool you down! New to surfing? Santa Monica is home to a number of great surfing instructors and surf camps that will get you started. 8. Pool at the Beach – Saltwater not your thing? Jump in and cool down in the historic pool at the Annenberg Community Beach House where you can still put your feet in the sand and enjoy the ocean breeze — without the salt. 9. Beach Butler – Perry’s Café’s Beach Butler service will set up beach chairs, table and umbrella at a designated time and location, deliver sunning products, chilled beverages and food. The best part: they handle the clean up, so you don’t have to! 10. Cool Jazz – Bring a picnic, blanket and beach chair, and enjoy a sampling of jazz each Sunday in August held on the lawn of Santa Monica’s City Hall. Get up and â¨move to the music then cool down with a frozen treat from the frozen dessert trucks, Lake Street Creamery â¨or A ROCKIN ICE Hawaiian Shave Ice. Santa Monica Convention & Visitors Bureau (SMCVB) is a non-profit organization designed to increase visitor expenditures, tourism revenues and local employment opportunities through the promotion of Santa Monica as a travel destination. For travel and accommodation information or a free copy of the Official Visitors Guide, the public can write to the Santa Monica Visitor Center, 1920 Main Street Suite B, Santa Monica, CA 90405; call (800) 544-5319 begin_of_the_skype_highlighting (800) 544-5319 end_of_the_skype_highlighting or (310) 393-7593 begin_of_the_skype_highlighting (310) 393-7593 end_of_the_skype_highlighting; visit http://www.santamonica.com; or email info@santamonica.com. Follow SMCVB on Twitter @GoSantaMonica or become a Facebook fan at www.facebook.com/visitsantamonica.